West Roxbury, Mass.-- The CM Model UN program hosted more than 200 delegates from 13 schools at its 7th annual Model UN conference on November 17, 2018. Hosted in collaboration with Ursuline Academy’s Model UN program, the event invited Mr. John DiFava ’69, CM alumnus and MIT Chief of Police, back to campus for the keynote address during the opening ceremonies. He spoke on the injustices of recent police scandals and how the police force can move forward in addressing these problems. 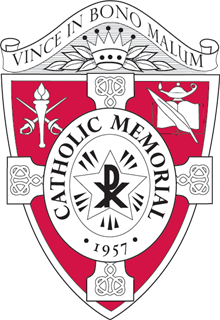 “The Catholic Memorial Model UN Conference VII continued to be the biggest and best high school 'day' conference in the Boston metro area for the fall season,” said Mr. Vincent Bradley, moderator of the program and CM’s History and Social Studies Department Chair. As the host schools, CM and Ursuline students staffed the conference and served as the chairs of the various committees while students from the visiting schools served as committee delegates. 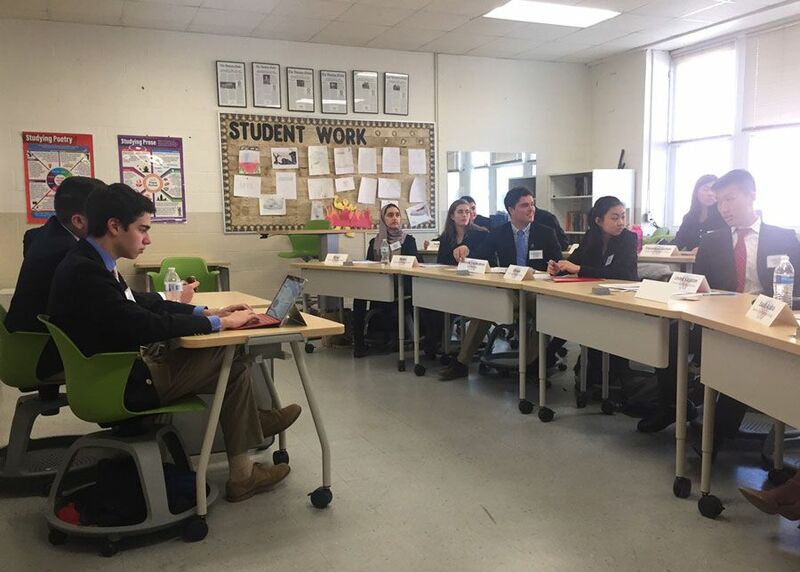 At this year’s conference, committees discussed and debated topics including the Yemen Civil War, sea level rise, human trafficking. They also served as NBA owners and predicted what forms of terrorism might exist in the year 3000. “It took weeks of preparation to make the conference happen, but I felt it was really worth it when I saw how engaged all of the students were. With hundreds of students and coaches attending, it was great to see the outcome of all our efforts,” said senior Will Dashe who served as the President of the Conference. CM established its Model UN program nine years ago. It began hosting its own conference in 2012, which has now grown to be one of the most enjoyable and professional conferences of the debate season in its seventh year. "Prior to the actual day of the conference, there are a lot of stressful nights and plenty of work but it's refreshing to see that all pay off during the conference when everything is running smoothly and people seem to be enjoying themselves," added John Costello, a senior who served as the Executive Director of Operations. Model United Nations are simulations of the UN General Assembly, UN Security Council, and other multinational deliberative bodies. As delegates, students debate and draft resolutions to collaboratively solve the world’s problems. Through their participation, students learn about current and historical world events, research interesting topics, debate amongst each other, and learn about decision-making and the potential consequences of their decisions. CM’s students have the added benefit of learning not only through debate at other conferences, but from their experience in conference preparation and execution. “This leadership experience helps students build confidence, while also providing an excellent delegate experience for the schools that attend,” noted Mr. Bradley. CM attended a conference at St. John’s Shrewsbury earlier this year. Later this year, the CM delegation will attend conferences at Boston College, Lexington High School, Sandwich High School, and Boston College High School and is already preparing for CMMUN VIII next year.